About 5 years ago, we went to my mothers for Thanksgiving and she had made a cornucopia of bread. An actual cornucopia, of BREAD! Stuffed with more bread! I was in awe. 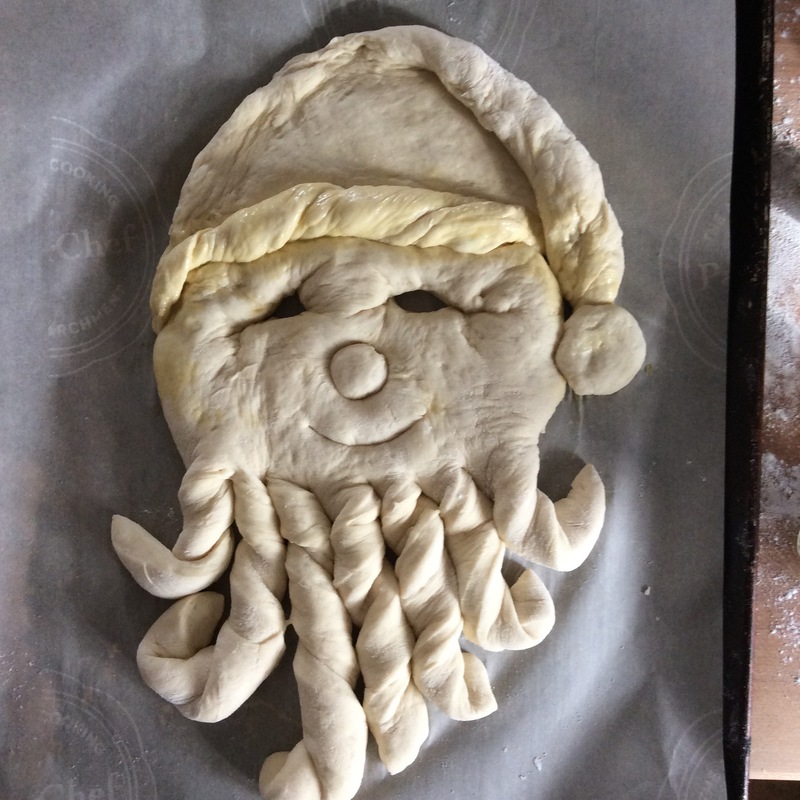 Long story short, it started me on a path of food art that was entirely new for me, and while I’ve never done anything exceptional with it, we do have our annual Santa Baby. 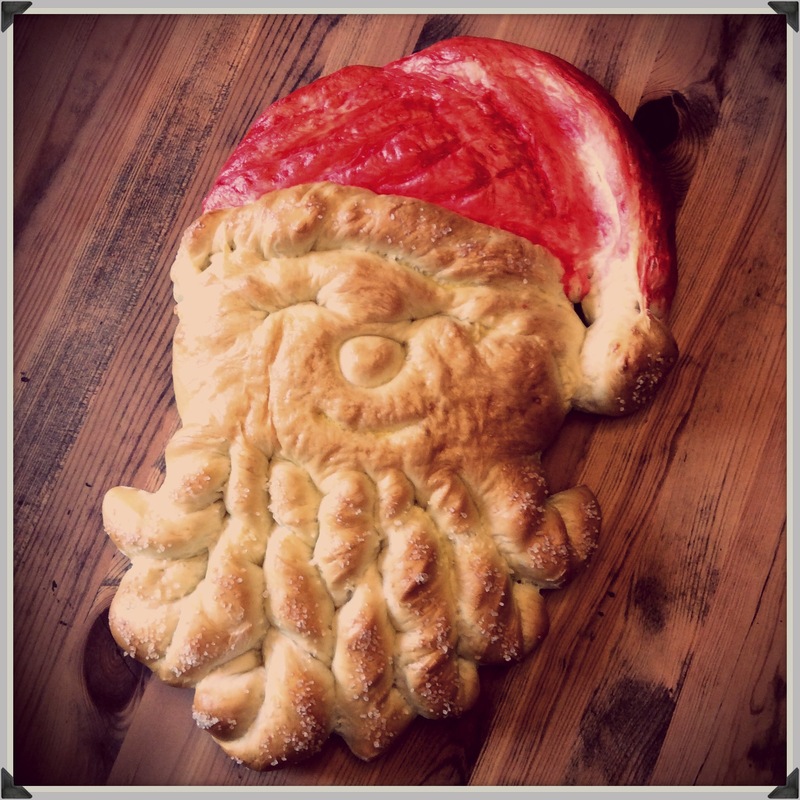 Santa-Bread-Baby, to be exact. This year, my 12 year old daughter and I worked on it together. She can’t have gluten, but she loves to decorate. The red hat was actually her idea, the salt was mine. 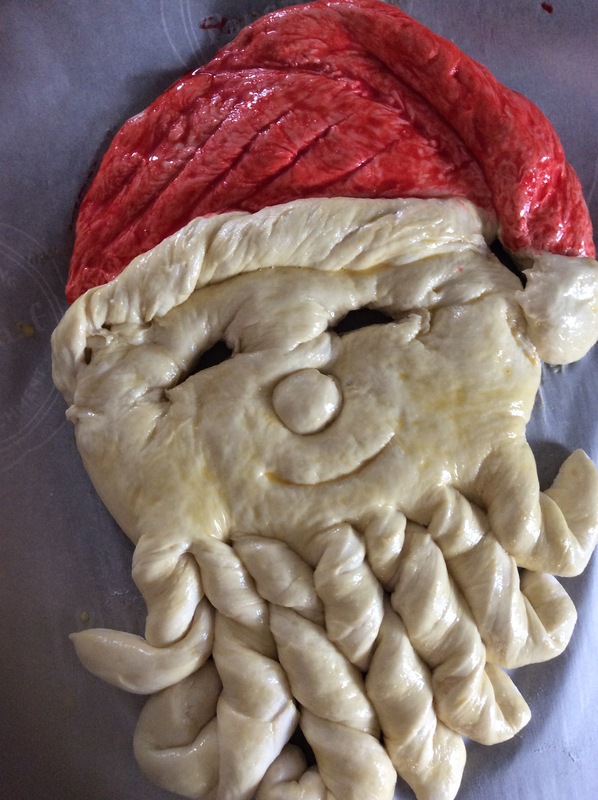 Together, we made a fine little Santa. I just love baking with my girl! The steps are Pictorial. If you have a hard time with any of it, ask! 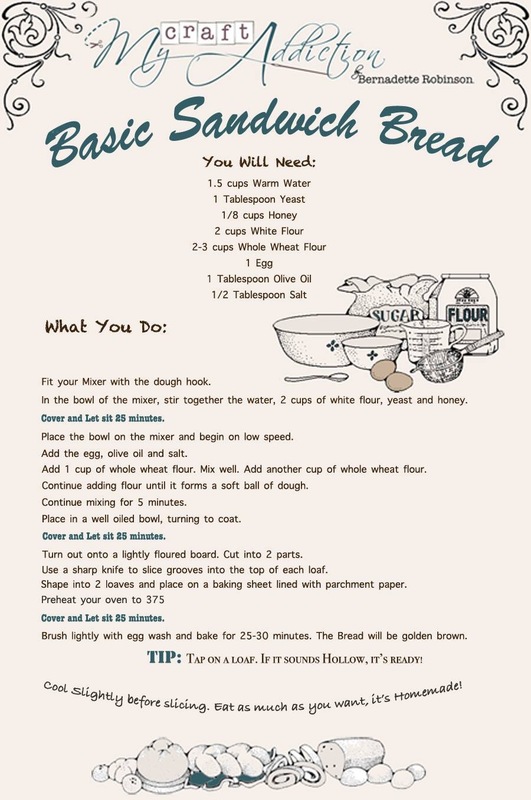 Make your bread. 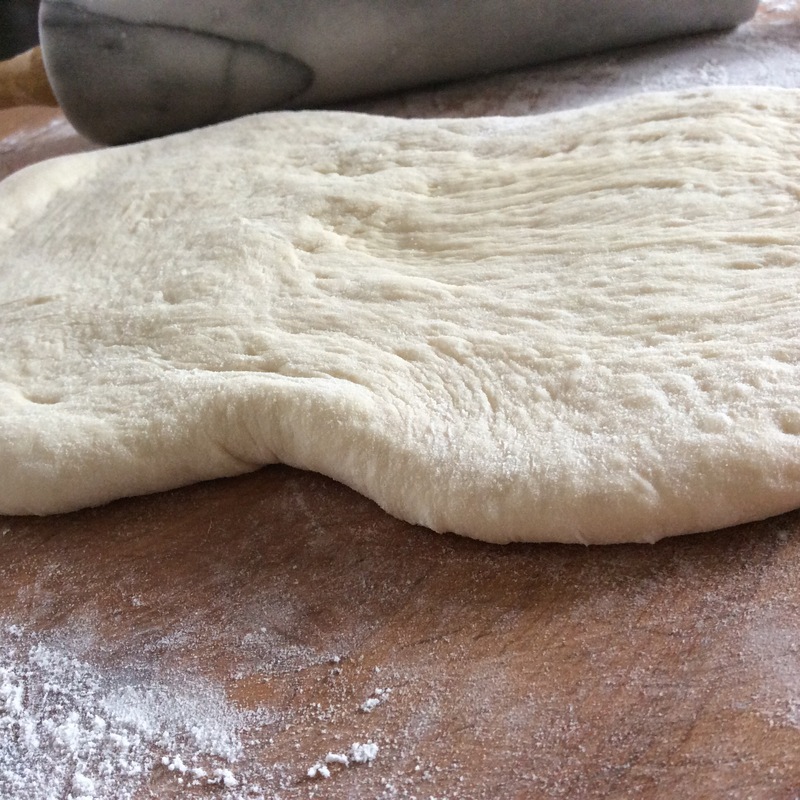 When you get to the loaf shaping stage, cut your dough into 1/2 and two 1/4 sections. 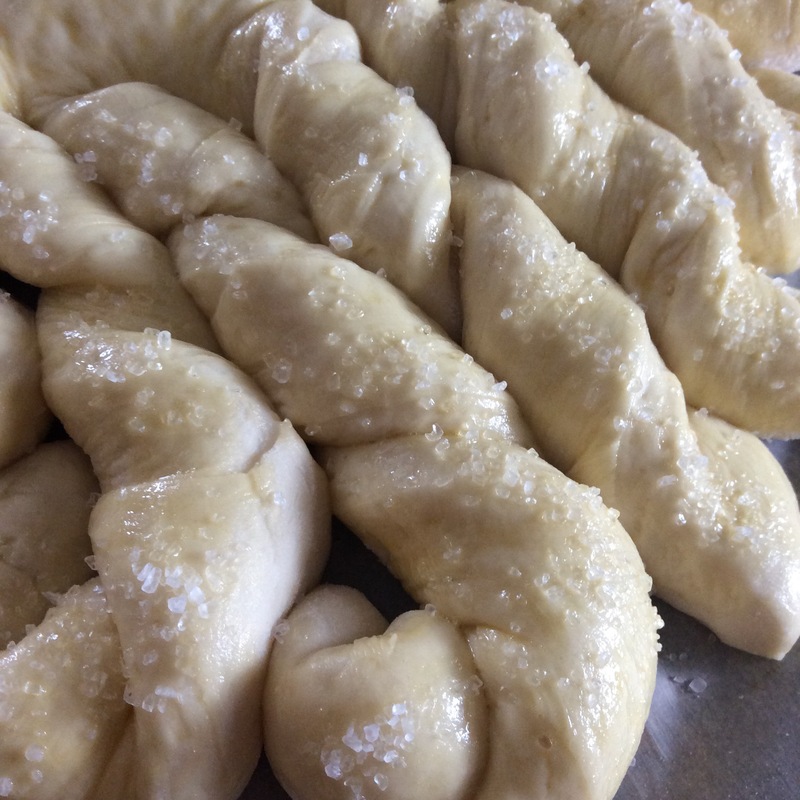 Roll the 1/2 section into a long, oblong shape. About 1″ thick. Cut the bottom portion into long sections. It doesn’t have to be perfect! 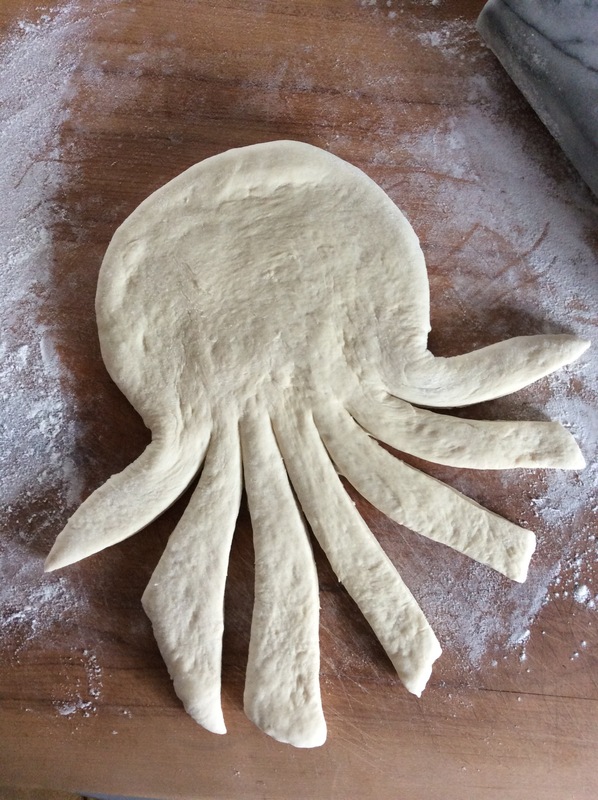 It’ll look so much like an octopus at this stage, you might want to store that idea for summer! I use my hands to shape the head a little. 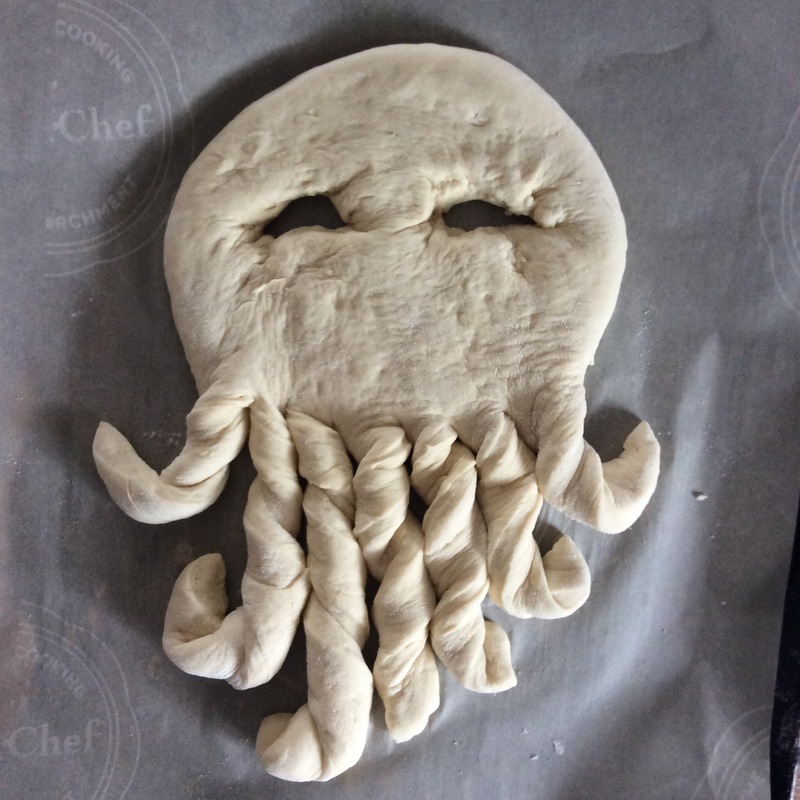 Move this guy to a large baking sheet lined with parchment. It’ll be easier to work with. Curl and twist the beard pieces. I don’t do them all the same direction, it’s just whatever I feel looks good. Cut out the eyes. Make them huge! In the end, you want nicely closed, crinkle eyes, if the eye holes are too small, you won’t have any eyes at all. Cut the top of the head off, that’s going to be the twisted brim of the hat. Set it aside. 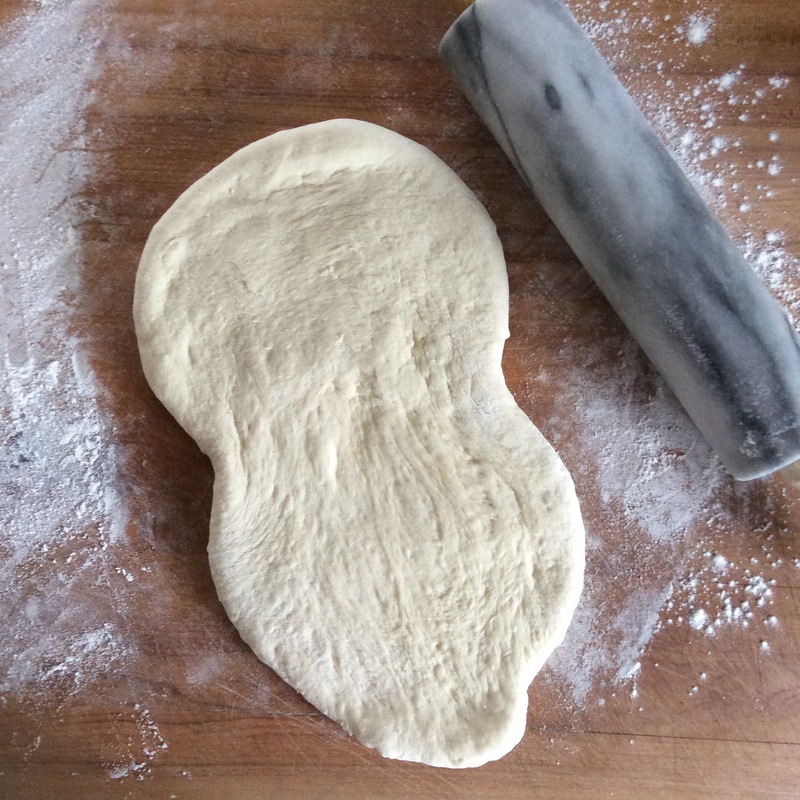 Use one of the 1/4 sections of dough, roll out and shape a hat. Notice that the eyes are already filling in. Keep shaping them with the end of a butter knife. Use some egg wash to “glue” if needed. I usually shape my hat, then put the twisted brim on. I also add a round ball to the end for a Pom Pom. The nose is done with a round cookie cutter. Cut out the nose, shape it into a ball and stick it back into the hole. Use a knife to cut a deep, wide smile. Let this rest for 25 minutes, loosely covered with plastic wrap, and set your oven to 375. JUST before baking, brush the entire thing with egg wash.
Once you’re done, mix some red food colour in with the remaining egg wash, and paint your hat! I then sprinkled some nice kosher salt over the brim and beard, for sparkle (and because I’m a salt-a-holic). Bake for 25 minutes and done! 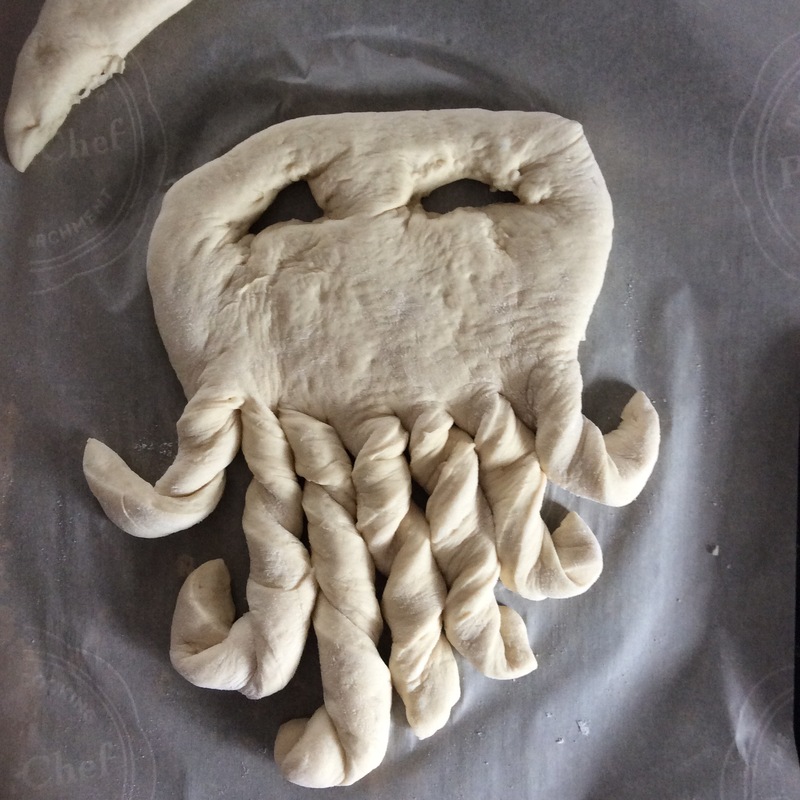 Once it comes out of the oven, it’ll smell amazing. You might be caught leaning over this face, inhaling deeply. You might even tell him he smells so good. This won’t be weird, at all.